Today, we're thrilled to introduce you to Heidi, the jewellery designer behind 'Trinkets By Moonlight'. 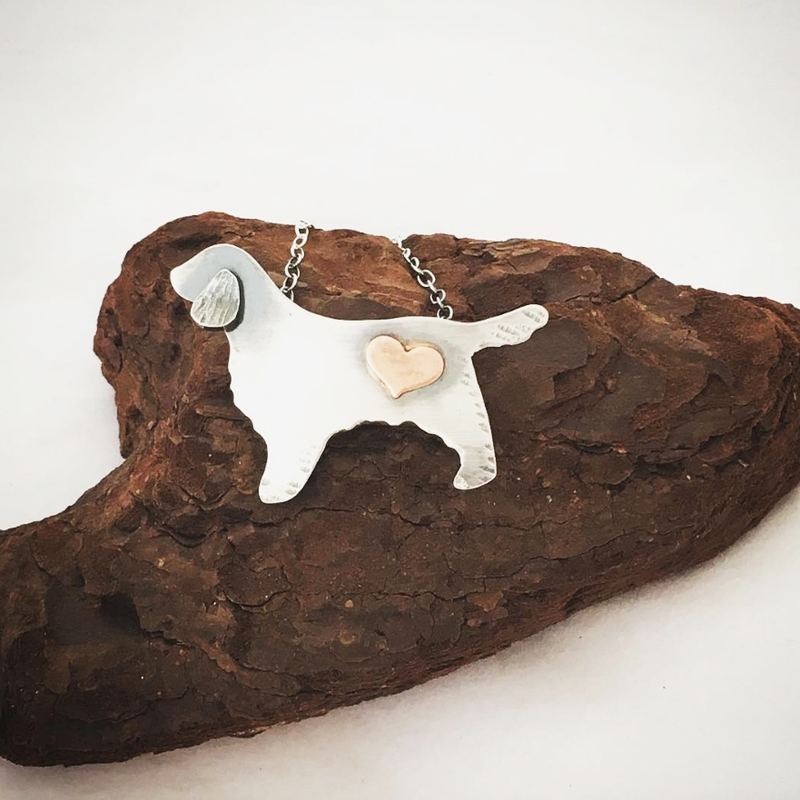 Heidi creates beautiful jewellery, focusing on personalised items from pendants, keyrings to bookmarks! 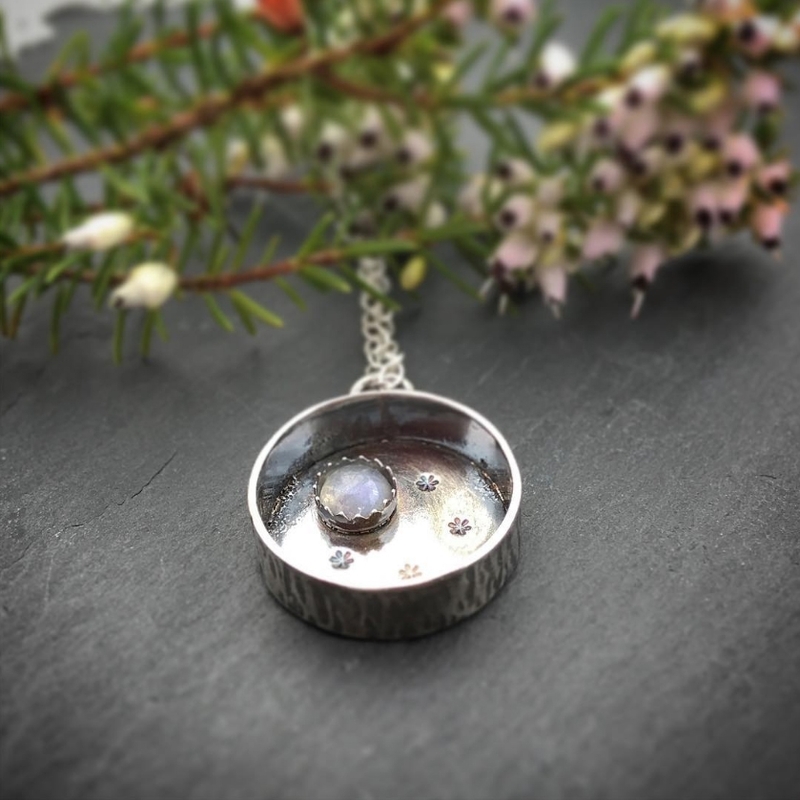 Working as a Holistic Therapist and then becoming full time mum, she tried jewellery making for the first time and fell in love. 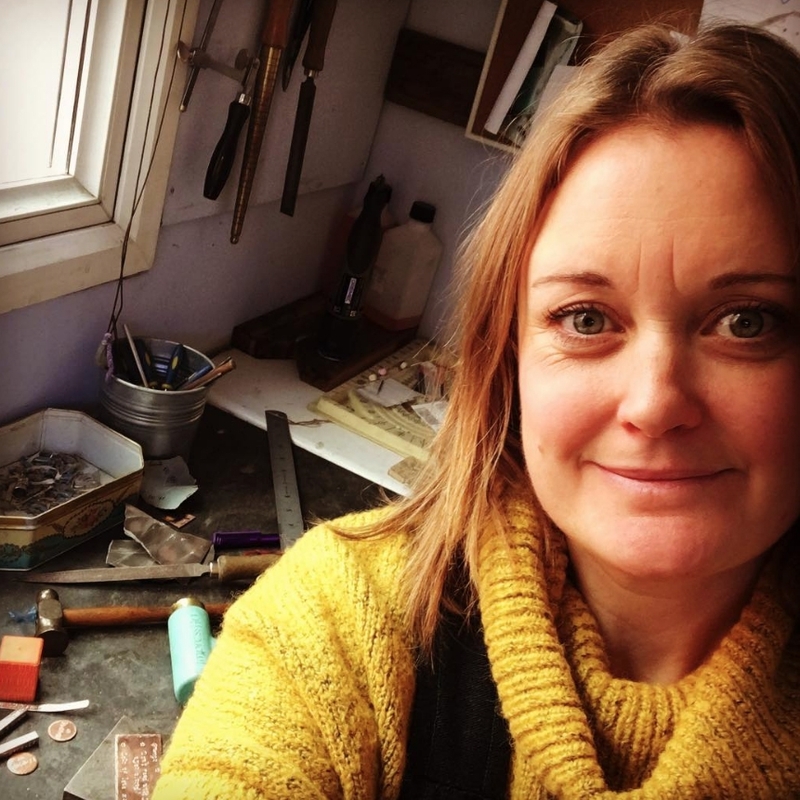 Now Heidi runs her own handmade jewellery business at home in her garden workshop. Read the interview below, where we find out more about Heidi's jewellery making background, favourite techniques and why she loves creating personalised jewellery. I have a very strange looking CV indeed, which almost reads like I've made it up! I studied Archaeology at University and always hoped to go on to work with the Police Forensics, however, after graduating I found that jobs were very far and few between so I ended up in an office job at an accountants in Southampton. I decided I really wanted to do something which would make a difference to people, I know it's a bit of a cliche but I liked the idea of having a positive impact on someone's life and so I went back to college and trained as a Holistic Therapist. After training over a few years I qualified in a wide range of holistic therapies including reflexology and aromatherapy. I truly loved treating people and making them feel better and I ran my own business as a holistic therapist for nearly 8 years. However, when I had children that all changed, I was so tired all the time (neither of my beautiful babies enjoyed sleeping at night!). I just didn't have the energy to go back to holistic therapies! 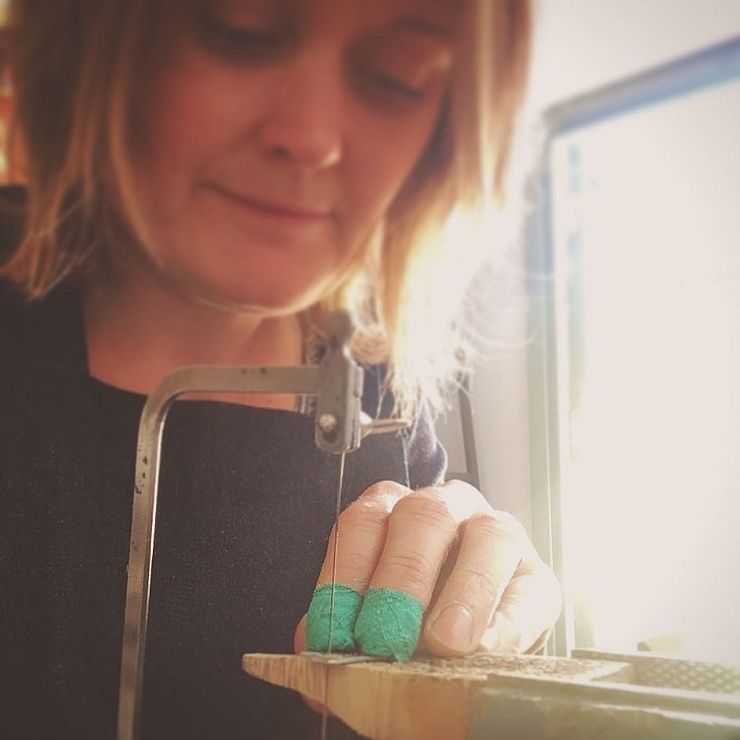 After a few years of being a full-time mummy, I was ready to learn something new again so I started making jewellery with beads and gemstones, but this just wasn't enough for me so I decided to go back to college. I went to my local college and trained in the basics of silversmithing and I was hooked! I loved the fact that you could make a plain piece of metal into something beautiful that someone would treasure forever. 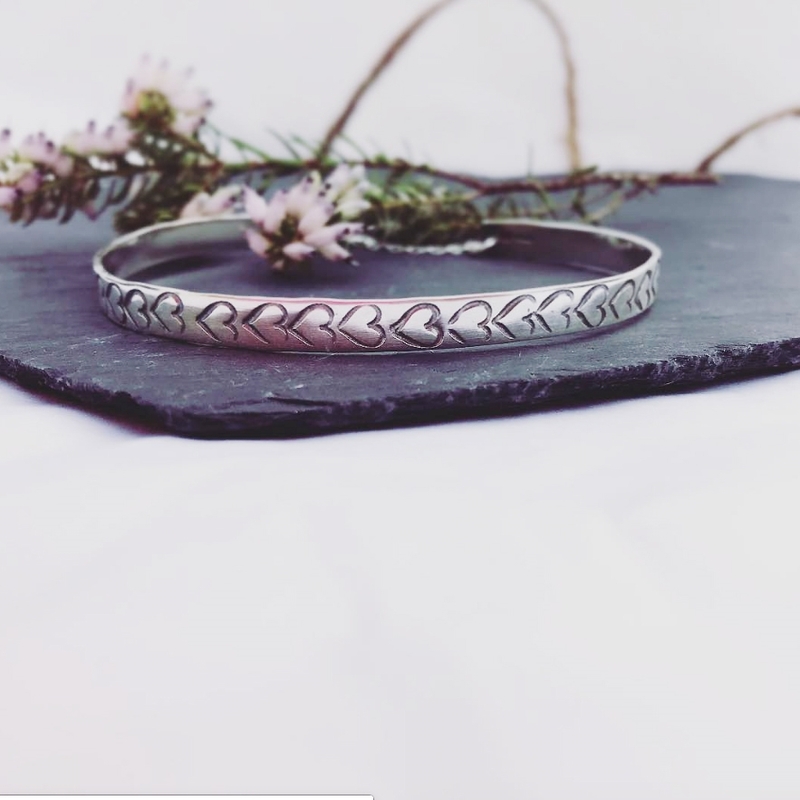 In a way it was still fulfilling my need to help someone feel better, creating jewellery which they could have personalised with special words of encouragement, names of family members or special dates all acting as a constant reminder on their wrist or necklace of their loved ones. Jewellery which hopefully would make them smile! I love making personalised pieces of jewellery, sometimes I have absolutely no idea what the sentiment means and I love that fact that only the recipient would understand the message. Other times it can be lyrics of a song that is special to the customer and I spend all day in my workshop with that song going round and round in my head. 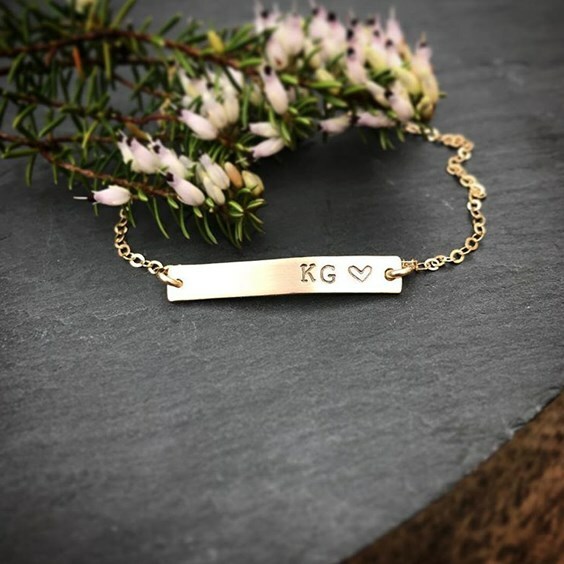 I make a wide range of personalised items from small copper keyrings and bookmarks which often have dates or coordinates of a special destination on them to sterling silver cuff bangles or matching heart pendants for mothers and daughters. What’s been the most special piece of jewellery you’ve created and why? Each piece of jewellery I make is special, I put my complete heart into each and every piece I make be it a small keyring or a bespoke pendant. No matter the cost of the jewellery I'm still putting my everything into making sure I'm perfectly happy with it before it's sent out, and unfortunately for me, I'm a bit of a perfectionist so I'm definitely my toughest critic! Some of the pieces which stand out for me most are the pieces I make which are in memory of loved ones. I recently made a hot air balloon pendant for a lovely customer and friend of mine in memory of her daughter who was sadly stillborn, her two other children believe that she floats around in the sky in a hot air balloon so I created her a sterling silver hot air balloon pendant with copper basket with her little girls name stamped on the back. It was a real pleasure to make and my customer was really happy with the outcome. What’s your favourite way to texture metal? My favourite way to texture metal is my faithful hammers. I have several to create different textures but I have an old one which I use the most to give a dimpled look. 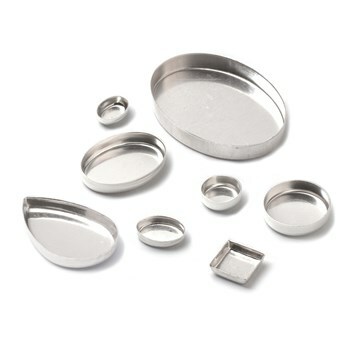 I would love to get a rolling mill one day to experiment with different textures, that's on my ever-growing list of techniques to learn! Tell us about your workshop and how you’ve made it your own! I have a lovely cosy workshop in my back garden, Trinkets HQ! My very clever husband built me a workshop and painted the inside a beautiful dark green so it's a great place to be. I have a heater out there with me so I don't get cold in the winter and a spare seat for when my daughters are called in to help me with packing orders up when times get busy! I have a pin board where I make mood boards for inspiration and lots of pictures of my precious family! How do you find inspiration for new designs? I enjoy thinking up new designs and can be inspired by many different things be it a walk in the forest, a scrap of wrapping paper or just a beautiful gemstone. I find that often at night when I get into bed my brain starts coming up with different designs, I keep a notebook by the side of my bed as often when I get in bed it's the first time in the day when everything is just quiet and I am alone with my thoughts and then as I am dozing off the ideas seem to flow! 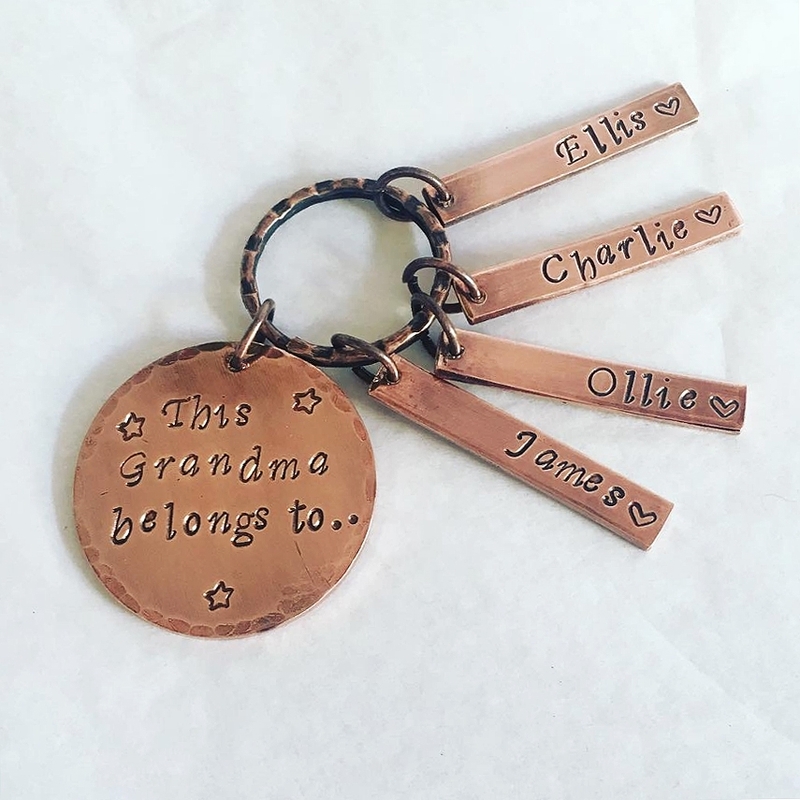 What tools and techniques do you use for your personalised items? My most used tools are my saw, heavy brass hammer, my steel block and my letter stamps! Each letter is individually stamped by hand, letter by letter, sometimes I think I must drive my neighbours mad with the banging! I love making personalised pieces, but I also enjoy the whole process of creating a new design! I have a long list of new techniques I would like to learn, but there literally isn't enough hours in the day! Tell us about your packaging! Packaging! Argh! I am constantly updating my packaging! I think when someone purchases jewellery which is handmade they want that something a bit extra. I want my customers to feel special from the moment they contact me to the moment they receive that parcel through the letterbox. I want the opening of the package to be part of the whole experience so I always make sure it's beautifully packaged in a Trinkets By Moonlight branded box, with a thank you note, polishing cloth and card which tells you how to look after your jewellery. I've recently started using recyclable packaging too as I use so much packaging throughout the year I wanted to make sure I was being as eco-friendly as I could. My favourite gemstone has to be blue chalcedony, I have tried other gemstones but I'm always drawn to this one. I love that it reminds me of the sea, blue sky in the summer and I love the colour against the darkness of oxidised silver. What’s your favourite metal to work with and why? I mainly use sterling silver but I love copper! I just adore the different colours you can get from copper, how it begins all shiny and new looking but using a hammer to give it a texture and then liver of sulphur to oxidise it can make it look completely different, really rustic and old. Why do you think personalised items are so popular? I think personalised items are really popular as it turns a simple gift like a bangle into something just that extra bit special. The surprise when someone opens a present and then sees that it has been made specifically with them in mind, with a message which is completely personal to them makes that person realise that you have put that extra bit of thought into their gift, it makes them feel loved and special, then every time they wear it and look at it they'll remember that they are special and that in turn will make them smile! I know cheesy but true. What are your jewellery making goals? I am hoping to expand my business this year, I have started the year with many lists! I also have several techniques which I would like to try such as enamelling. I have wanted to master this for a while and every now and again I have a try but I would really like to get good at this so I could start incorporating it into my work, I love all the different beautiful colours you can create. I love using Kernowcraft and have done for many years. I had a great surprise one day when we were on holiday in St Agnes in Cornwall and went out for a bike ride around the beautiful surrounding countryside and came across a little building which said Kernowcraft! I suddenly remembered that of course, that's where you are based. I couldn't just cycle pass so we stopped off and had a look at all your wonderful stock, purchased a few bits before continuing on our bike ride. How I wish you were closer so I could come in and look through all your wonderful gemstones! 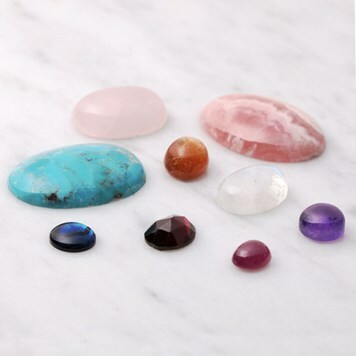 I use Kernowcraft for all my cabochons, they have such a great variety and perfect for my birthstone jewellery! Sterling silver bezel settings are a great way to save time especially the small stone settings which I always find tricky to make myself. And thirdly alligator tape. This is a lifesaver for my poor fingers! Before I discovered this the ends of my fingers were so sore and could easily get cut, my hands are still dirty silversmiths hands, but the cuts are a lot less now!